Bake My Day! 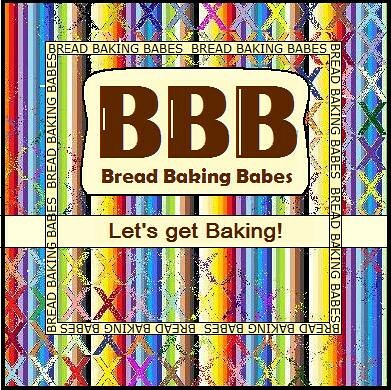 : Bread Baking Babes: When the going gets tough.. Bread Baking Babes: When the going gets tough..
you get crackers! Swedish knäckebrot to be exact. Our Kitchen of the Month girl Görel over at Grain Doe enthralled us with round rye crackers, made with a rye-starter and a rye pre-ferment. Lots and lots of rye. I love rye! The starter had to be made with grated apples! Yum! 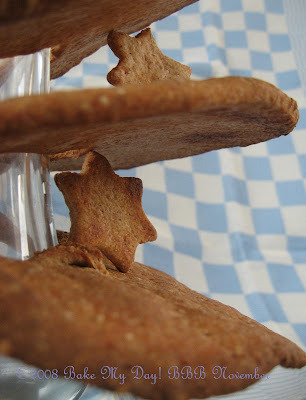 My kitchen would smell like a distillery and I would get to munch on knäckebrot as a reward. Did I mention I love my knäckebrot? Rye. Baking with rye has its moments. Baking with sharp rye -as in whole rye- has even more moments enhanced with colourful language. My starter matured without a hitch, it survived our stay in Rome, and was easily revived for use in the pre-ferment. I accidently -nah..did it on purpose ssst!- switched the amounts of rye and whole wheat in the final dough. I was running low on rye and forewarned by Lien who had some difficulty getting the dough consistency right I decided to use whole wheat as my main flour. It turned out to be a good one, my dough had what I thought to be the right feel to it. No adding water/no adding flour. Rolling it out to the final crackers wasn't difficult, deciding how thin it was going to be proved harder. I settled for medium thickness but got chewy crackers. 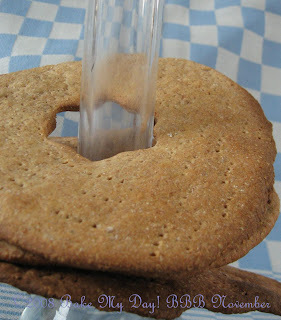 The revelation waited in the middle; I cut out a hole using a cookie cutter and those were perfect!! Nice, cute and crunchy mini-crackers! The flavour. Yes, most important. I loved the flavour of those tiny ones! Absolutely great. So what I need to find out is how thin they have to be, or else bake loads and loads of mini ones. Thanks Görel, this was a challenging one! Our Bread Baking Babes can be found on the right hand side column. Join us this month and get your own Baking Buddy Badge! The recipe is to be found here. I loved the star shaped holes, I would never have thought of that! I'm glad you liked it! NOu de volgende keer alleen maar kleintjes maken misschien?! yes it is funny how they all look different. Even my two batches look quite different. Great job! They look really tasty. Respect! You made your own knackerbrot and made it look cool too. We bought ours in IKEA. I leave shame faced. 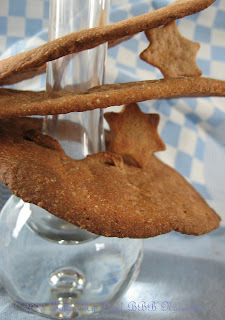 Now that knackerbrod is a "star" attraction (he-he..I crack myself up). I hadn't thought the hole would help to make the bread crisper but I guess it makes sense. I agree though about the taste. Ik moet nog aan de slag, als ik zie hoe jij het eraf hebt gebracht...geweldig ! Looks great and super pictures! I came from Sweden when I was quite young and all my life I remember hearing my mom talk about Knackerbrod. Won't she be surprised when I make these for her :). Thanks for the recipe.